Product #18683 | SKU ADOGM-001 | 0.0 (no ratings yet) Thanks for your rating! You are no longer limited to capturing from a human's perspective, with the GoPro Fetch you can shoot from a dog's POV too. The harness features two mounting locations, enabling you to choose what works best. 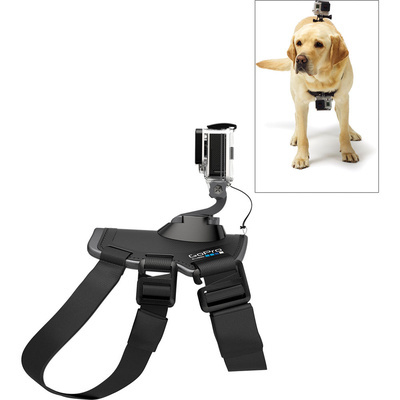 One is up top, over the back, and is ideal for over-the-head shots of running, jumping, fetching, and more. The other places the camera below the chest and is perhaps best for bone-chewing, digging, and front-paw action. The all-weather design is safe to get wet and fully washable. It can be adjusted to fit most size dogs.